On the drawing board this week is an artist’s studio in Calverley. This is our third client who practices as an artist, and admittedly, it is good fun to work with a family who shares our passion for design and creativity, and who are keen to explore alternative ways at looking at things. The house is a semi-detached property in the lovely village of Calverley built in the late 1950s. It is well outside the Conservation Area in a neighbourhood characterised by a semi-detached and detached properties built from the 1950s onwards developed in various ways over the years: lots of extensions, large dormers and garages have all been built to meet the needs of their owners. Consequently, the character of the area is defined by a mix of design responses in a typical suburban area. 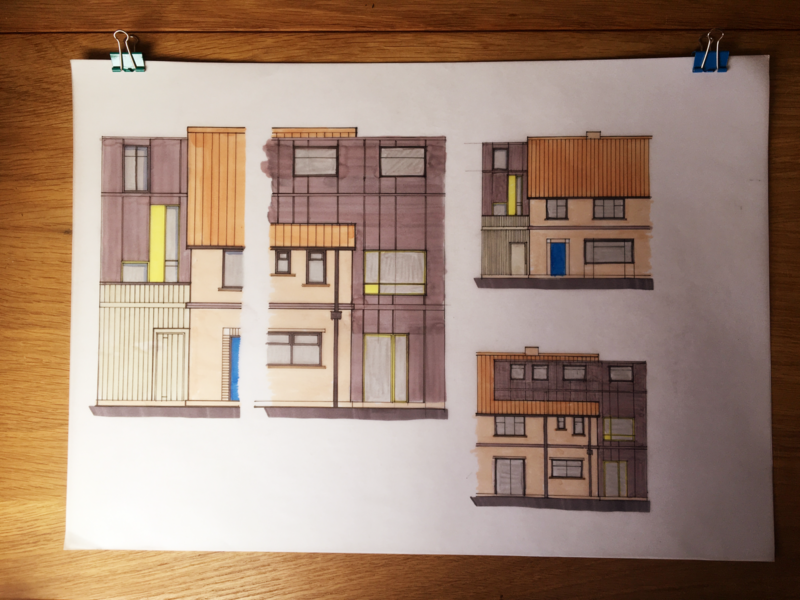 Our client’s house forms a chain of semi-detached properties that are linked to the next semi-detached house via outhouses and sheds. Neighbouring properties have replaced these outhouses with garages or have converted the spaces into kitchen extensions so they have lost some of their original essence over time. The houses are built of a deep red engineering brick with a red-black string course and plinth, with the window cills being made from tiles typical of that period. This particular project comprises a side extension with a dual purpose. It is to be an artist’s studio now but has the opportunity to be converted to an annex for the client’s son in 10 years time. 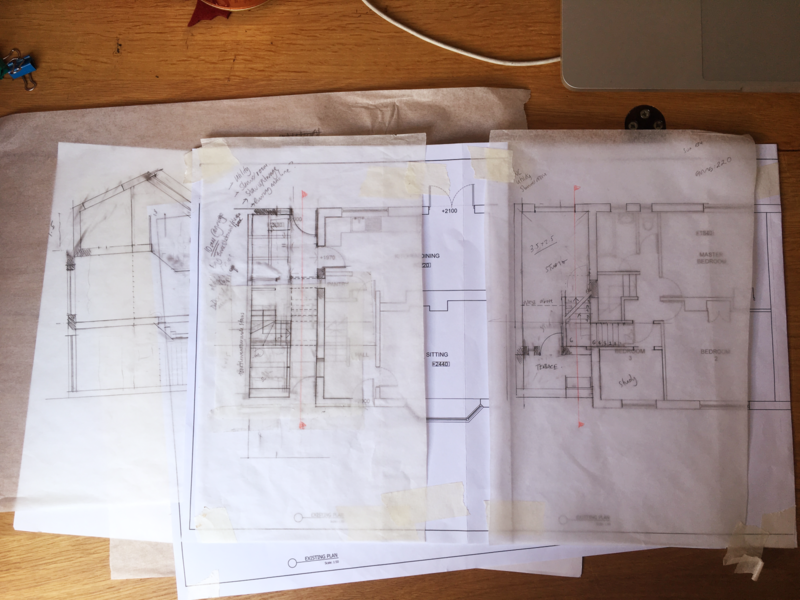 It has been a challenge to fit the contents of the brief into a thin strip of land 2.5m wide, but we have been exploring how we can make use of the full height of the existing building to create a mezzanine level. This allows the ground floor to have the ‘functional’ spaces like the utility and shower rooms, whilst creating an open plan and – crucially – a bright space suitable to meet the needs of an artist’s studio. A key part of our brief is for the extension to have a clear separation from the main building – to be contemporary and, importantly, not to match the existing. The client is inspired by industrial aesthetics which we personally love but could be difficult to create within a suburban setting. We are exploring how we can achieve this and the direction in which we are going is of an ‘honest’ one. Materials are to be exposed for what they are, which is much harder to achieve than it sounds as it does rely on quality craftsmanship and some well designed construction details that both work and look good – think delicious stainless steel bolts and polished concrete. To compliment the red engineering brick, we are looking at cladding the extension with zinc or a commercial composite cladding so that the addition becomes a ‘shadow’ next to the original red semi-detached property. Part of the project is to convert the loft so we are exploring whether we could tie the two elements together. One thought is to cantilever the loft stair into the mezzanine. 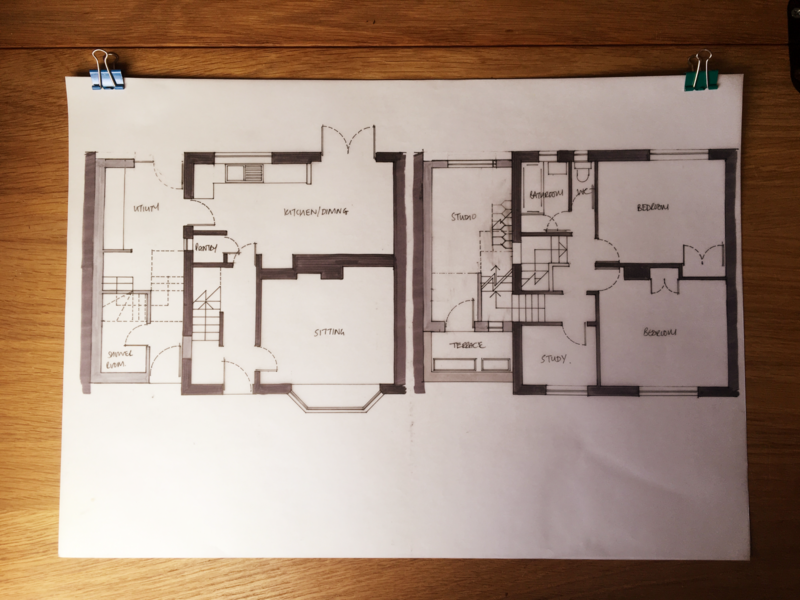 This would prevent us from losing the third bedroom in the main house, but with the added benefit of creating an usual feature within the extension. 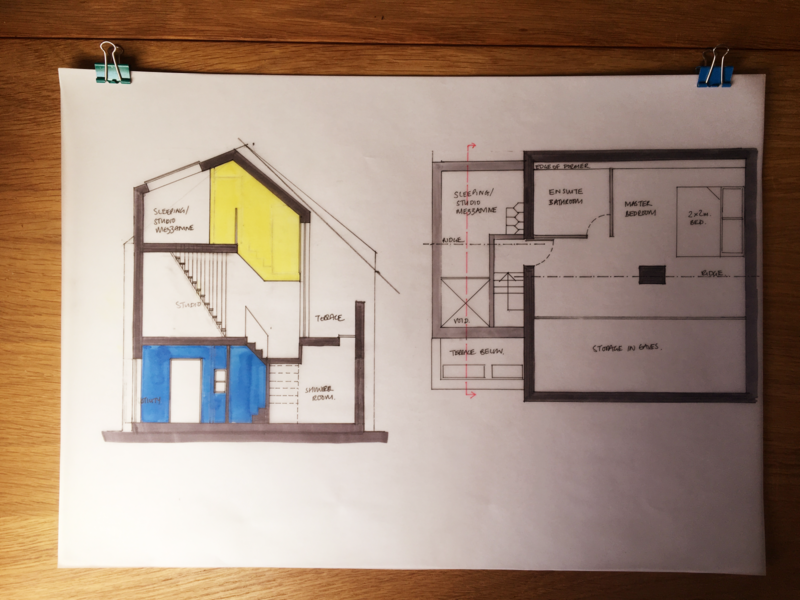 In terms of the plan, this completely meets the needs and aspiration of the client, but in terms of the elevations, creates a bulky rear elevation, so we are looking at how this can minimised. This is an ongoing project with an enthusiastic and creative client, so do keep watching this space for updates on how we progress.